Fatal opioid overdoses in Chittenden County decreased in 2018 to the lowest level in at least six years, local and state officials announced Thursday. The number of deaths fell by 50 percent, from 35 in 2017 to 17 last year. The recently released Vermont Department of Health data offers "measurable evidence we are in fact advancing as a community," Burlington Mayor Miro Weinberger said. About two dozen health officials, law enforcement officers, politicians and nonprofit leaders touted the progress at a press conference in the Queen City. At the same time, the total number of Vermonters who died of an opioid overdose continued to increase. The state tallied 110 such deaths in 2018, up from 108 the previous year. The total sets a new record for opioid-related deaths in Vermont. Fentanyl-related fatalities also increased substantially. The potent, synthetic opioid was involved in three-quarters of all opioid deaths last year, according to the data, triple the number in 2015. Heroin was also involved in 55 percent of the deaths, often in conjunction with fentanyl. More than 90 percent of the fatalities were accidental, while the rest were undetermined. The 110 deaths included one Vermonter who died out-of-state, but did not include the six non-Vermonters who died in the state. Three suicides involving opioids were also left out of the tally, according to the Health Department. Chittenden County State's Attorney Sarah George said she "felt incredibly defeated" when she saw the 2018 statewide numbers. The loss of lives is "entirely unacceptable." But much of Thursday's event focused on the positive. Weinberger praised the ongoing work as "one of the most comprehensive and robust responses and interventions of any local community anywhere in America." He highlighted the success as a group effort: The University of Vermont Medical Center had cut down on opioid prescriptions; local law enforcement no longer arrests or prosecutes possession of buprenorphine; medication-assisted treatment has become readily available. Howard Center CEO Bob Bick detailed his organization’s progress eliminating waitlists and handing out more than 20,000 doses of the overdose-reversing drug naloxone during the past five years. The Howard Center now regularly serves 1,000 clients, according to Bick. Meanwhile, more than 8,000 people across the state are currently receiving medication-assisted treatment in state-supported facilities, Vermont Health Commissioner Mark Levine said in a press release Thursday. "News like we have today is worth talking about and appreciating," said Tom Dalton, executive director of Vermonters for Criminal Justice Reform. Still, officials emphasized the work is not over. 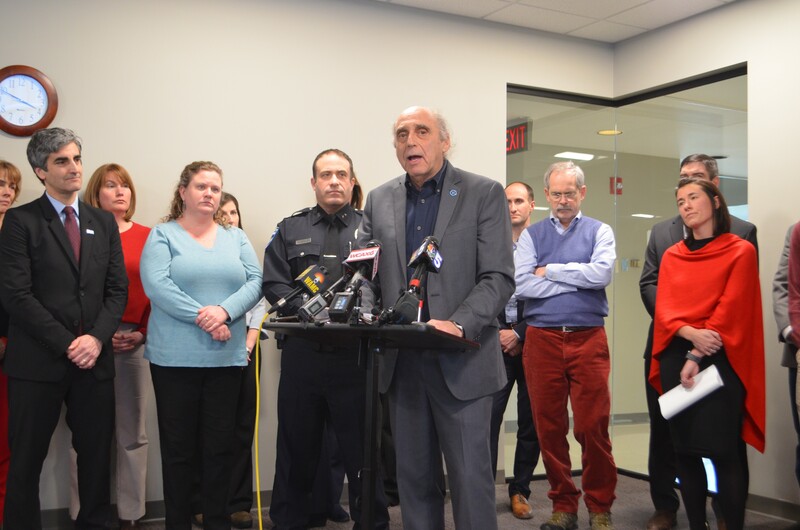 Local leaders will "redouble [their] efforts," Burlington Police Chief Brandon del Pozo vowed. "Let's continuously focus on our North Star, which is the number of men and women that are dying," he said.